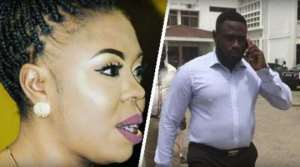 The matter between Valentina Nana Agyeiwa, aka Afia Schwarzenegger, a television host and a comedian and her husband, Lawrence Abrokwah was on Tuesday adjourned to February 15 by an Accra Circuit Court. The case was being heard in chambers, hence journalists did not have privy of what took place. The two are in court after Afia Schwarzenegger accused her ex-husband of recording and distributing a video showing her nakedness on social media. Abrokwa is facing five charges, including two counts of domestic violence, threat to harm, assault and publication of obscene material. He has denied all the charges and on bail of GH¢20,000.00 with three sureties. The matter took new twist following a decision by the prosecution, led by Chief Inspector Maxwell Oppong, to amend the charge sheet to include stealing, carrying offensive weapon and causing unlawful damage. Afia Schwarzenegger is accusing the former husband of breaking her bedside drawer and stealing an amount of $2,000.00 and 500 pound sterling. Chief Inspector Oppong said Abrokwa was living with Afia Schwarzenegger in her Dome Pillar two house in Accra but decided to pack out following recurrent disagreements. Prosecution said Abrokwa then went to the house and managed to enter by scaling the wall. According to prosecution, Abrokwa deflated the tyres of the car belonging to Afia Schwarzenegger's male visitor and entered the room through the back door with the help of the housemaid. Chief Inspector Oppong told the court that Abrokwa was allegedly wielding a knife and a bottle of acid with which he threatened Afia Schwarzenegger and the man she was reportedly sleeping with. Prosecution said the accused entered the room with his phone camera on and forced Afia Schwarzenegger to strip herself naked, kneel down and confess that she is a prostitute. Prosecution said Abrokwa recorded the nakedness of Afia, which he later distributed on social media.